The embarrassment of acne can sometimes last longer than the condition itself, particularly if you’re affected by scars and pits left behind once the sores have healed. At Irwin Laser Center in Irwin, Pennsylvania, Dr. Karim Khalil can help you manage the condition while acne is active, and can treat your skin to minimize the appearance of acne damage. Call Irwin Laser Center, or schedule an appointment online. Oils and dead skin combine to plug hair follicles, creating a haven for bacteria, resulting in inflammation, which creates the symptoms of acne, including whiteheads, blackheads, pimples, and red spots. The severity of the condition may be aggravated or triggered by hormones, stress, and certain medications. What does Dr. Khalil recommend for managing active acne outbreaks? Excessive washing and vigorous scrubbing of areas affected by acne can aggravate the condition and damage your skin. Be sure to follow the recommended cleansing plan, as instructed. 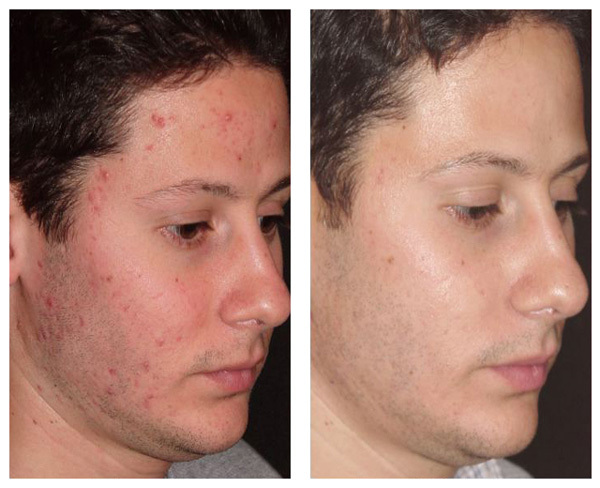 How does Dr. Khalil incorporate laser treatments for acne? Irwin Laser Center uses the Candela® Smoothbeam™ diode laser system. The Smoothbeam is a multi-effect, non-ablative laser, meaning that it does not remove skin tissue as part of its treatment. This makes for gentle procedures with little to no recovery time for you after an appointment. Laser treatment of this type targets deep skin tissue, where the light energy is absorbed and converted to heat. As collagen in the skin warms, it reaches a point where the body perceives that damage has occurred and starts manufacturing new tissue. This process of regenerating collagen adds new support to the skin underneath acne scarring, reducing the depth of pits and scars. The Smoothbeam system also alters the way the skin’s oil glands work, reducing the output of sebum, so it may also be a treatment option for active acne. Another laser system, the VBeam Perfecta® , also eliminates skin redness and controls inflammation involved with acne.